Exploring northern Vancouver Island’s San Josef Bay with Cove Adventures. Drive northwest past the ferry line-ups, strip malls, and highways choked with RVs. Carry on until you’re out of cell service. Keep going. Turn left at the old Hudson’s Bay post at Fort Rupert and drive until the pavement ends. This is where adventure begins. This is where most people are left behind in a billowing cloud of logging road dust. If you’re like me, this is where you shift the truck into four-wheel drive and slow down to avoid the ever-present perils of sliding around corners, sidewall punctures and losing the fillings in your teeth from the washboard road. The threat of ambush from double-wide logging trucks in the oncoming “lane” can truly turn your knuckles as white as driving through a West Kootenay blizzard. The road, or the lack thereof, to San Josef Bay has historically been a bit of an issue. 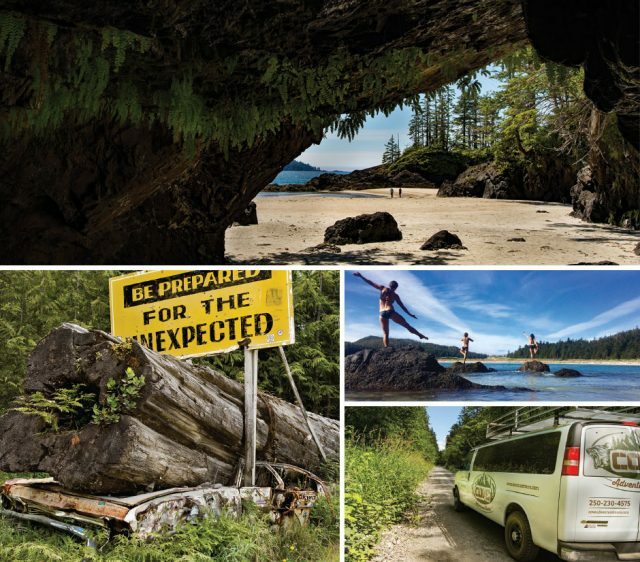 The siren song of the rugged, remote, and spectacularly beautiful northwestern tip of Vancouver Island has always been heeded by adventurous souls. For many, these adventures have not ended well. Shipwrecks, ghost towns, and abandoned homesteads peer back at you through the emerald green thickets of salmonberry and the Caribbean blue waters. Overgrown wagon roads, abandoned fences, and secret gardens tell tales of the strong backs and sharp axes of Rasmus Hansen, Nels Nelson, Bernt Ronning, and others who tried to carve a Danish farming village into fibres of this iconic wilderness over 120 years ago. In 1897 the first ship of Danish settlers arrived and by 1914 over 1,000 people lived in San Josef Bay. By 1930 only a handful remained. Settlement rights were granted by the Colonial government alongside a broken promise of a road that would one day connect the settlement to the outside world. Eventually, the settlers gave up waiting and left with what they could carry on their backs. Hailing from Port Hardy, Anna Burgess and her partner Chris Lindsay are intrepid young pioneers in their own right. Longing to find a way to share their passion for North Island adventures and to support a sustainable tourism economy in the region, Cove Adventures was born. Burgess and Lindsay offer fully customizable guided day trips into this remarkable part of the Island out of Port Hardy. Their meticulously maintained 15-passenger van is equipped and outfitted for the realities of life on the rugged roads they know like the backs of their hands. With a unique combination of laid-back style and professionalism mixed with deep local knowledge of the land and its history, they are able to weave together an adventure itinerary that fits every age and physical ability—from 200 million year-old fossil beds and turn-of-the-century botanical gardens hidden in the rainforest to the epic white sand beaches, surf, and sea-stacks of San Josef Bay. 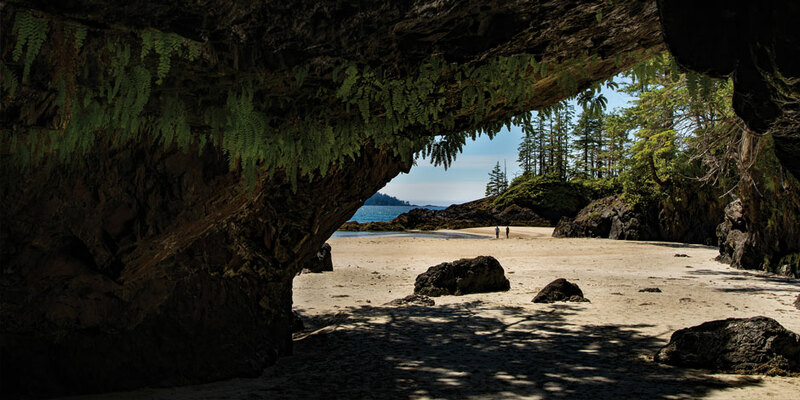 For many Island residents, fulfilling the urge to visit the ancient forests and white sand beaches on the outer coast of western Vancouver Island is like an annual pilgrimage. For others in more distant lands, it’s a lifelong dream. As the popularity of many of these remarkable destinations increases, so too does the desire to get a little further from the crowds. The sirens sing. The allure and mystique of San Josef grows stronger. If only it weren’t for that road! Fortunately, for those without two sets of spare 10-ply tires, satellite GPS, a forestry traffic radio, and four-wheel drive truck, the opportunity to travel to San Josef and Cape Scott Provincial Park in comfort and safety just got a whole lot more realistic thanks to Cove Adventures. This pair of explorers make uncovering the secrets of the North Island possible for anyone who hears the siren song.